Finn MacCool by Morgan Llywelyn. The Case of the Baited Hook by Erle Stanley Gardner, and RBP Resolution. & Noble today. I hope to start it tonight. Okay, technically it's editing, but I didn't see a thread for that! Just finished THE GRAND DESIGN by Stephen Hawking. Written for the lay-man, gives a brief overview of our current understanding of how the forces of the universe work. Having just finished my semi-annual foray into "On the Beach" by Nevil Shute, I began my equally frequent rereading of "City at World's End" by Edmond Hamilton. Also, approaching the end of my "lunchtime book", "A World Lit Only by Fire" by William Manchester. George R.R. Martin's A Game of Thrones, for at least the fifth time. Working my way through the series in anticipation of the new book in July. Visions & Beliefs In The West of Ireland by Lady Gregory. Lady Gregory went around the countryside in the 1890s and collected old superstitions from the Irish people about the Sidhe (Shee) and translated them from Irish. I have decided to look more at all things Irish. When I'm done with this its on to Gods and Fighting Men which is about Finn MacCumhal and the Fianna amongst other things. I was reading Drood but I put it aside to re-read George RR Martin's Fire and Ice series. Just finished A Game of Thrones and am halfway the A Clash of Kings. Like Hagerman, I've read these books many,many times but I'm preparing myself for the HBO series to begin in a few weeks, and the next book,finally!, in July. Finally -- FINALLY -- finished book 13 of THE WHEEL OF TIME! I hadn't read any of the Sanderson books, so picked up 12, and suddenly realized I hadn't read 11, the last of the Jordan books. So, I read 11-13 in one fell swoop. Martin's work leaves me stone cold. Absolutely no point of entrance for me. I imagine this must be very like the reaction I get from friends who have found Tolkien impenetrable. I enjoy reading and will often force my way through 3-4 chapters even if it seems the novel is beginning to tank (it might pick up again), but Tolkien always seems like such a struggle to get through. I don't know why. I've started a couple of Tolkien books on several occasions and they are just impenetrable for me. Perhaps it is a "point of entrance" for me as I can't find any hook at all. I try to read it (LOTR) once every year or so, After Dan Dare I'll take the dive again. I find myself having a different view on various part of the story that I've not picked up on before. 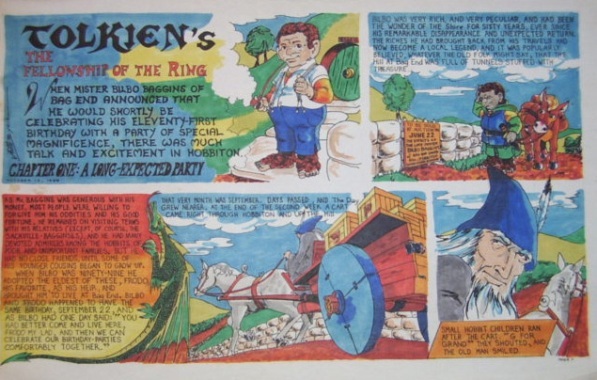 JB, I know you've tinkered with the LOTR before but do you think you would enjoy doing the whole story? Matt, for me, hearing it on audio the first time is what got me over the hump. Now it has a flow that just seems to click for me. For me, even The Hobbit, Paulo. I'm not a fantasy guy to start with. Among the multitude of books that are out there, I'm as likely to start reading fantasy as I am to pick up a Harlequin Romance. But friends have told me that Tolkien is different. Having tried several times I've come to the conclusion that it's not different for me. There is simply nothing to hook me at all. I think I've read THE HOBBIT and LOTR 4 times, for an average of once every 6 years or so. I try not to read it that often so as to keep it fresh. Also, the ending to LOTR always leaves me feeling sad. Re: Martin, I was a big fan of the series, but now I'm feeling a disconnect. I'll read the next book but I don't think I'll re-read books 1-4. 'm not a fantasy guy to start with. Among the multitude of books that are out there, I'm as likely to start reading fantasy as I am to pick up a Harlequin Romance. But friends have told me that Tolkien is different. Yeah. I would guess that's typical for those who don't care for the genre. After seeing it mentioned on the site (and I see JB mentioned it again here) I'm coming to the end of On the Beach. Today started on THE GREAT MONKEY TRIAL, by L. Sprague de Camp, a BIG book on the infamous Scopes trial in Tennessee in 1925. This is the trial dramatized (and fictionalized) as INHERIT THE WIND. I'd be interested in that book, JB, so let me know your reaction when you finish. Darrow, in particular, is a fascinating character to me.